Quintessentially American, Ed Ruscha is an L.A. based artist whose work, like California itself, is both geographically rooted and a metaphor for an American state of mind. Ruscha is a deft creator of photography, film, painting, drawing, prints and artist books, whose works are simultaneously unexpected and familiar, both ironic and sincere. His most iconic works are by turns poetic and deadpan, incorporating epigrammatic texts with nods to advertising copy, juxtaposed with imagery that is either cinematic and sublime, or wryly deadpan. Whether the subject is his iconic standard gas station or the Hollywood sign, a parking lot or highway, his works are a distillation of American idealism, echoing the expansive Western landscape and optimism unique to postwar America. 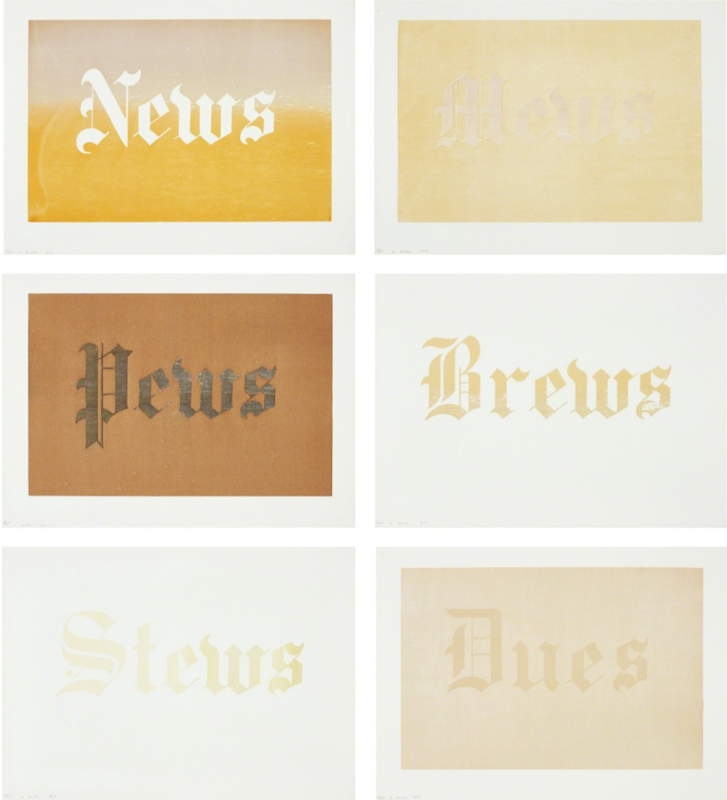 Ruscha produced News, Mews, Pews, Brew, Stews & Dues during an extended stay in London. To make each print Ruscha and Lyn Haywood would purchase unorthodox materials from grocery stores such as blackcurrants, Bolognese, chocolate syrup, axle grease, baked beans and Branston Pickle and use them as materials to print. A clue to the hidden meaning in the work can be found in his selection of the Beans. Heinz Baked Beans are considered to be quintessentially British, however they were produced in the United States from 1901 until 1928.The unfamiliarity of the words combined with the strange materials highlights Ruscha’s status as an alien observer in the UK but also how our assumptions about a subject, word or material does not always match its reality. Ed Ruscha (b. 1937, Omaha, Nebraska) attended the Chouinard Art Institute (now California Institute of the Arts), Los Angeles, from 1956 to 1960.